Who is that he is with? He is SO HOT too ~ what the hell is it about guys with long hair, leather jackets and ciggies?!? They are bad boys! That's why we love them, starting I guess with Marlon Brando in "Wild One" and James Dean in any of his 3 movies. I guess what I REALLY want to do is write my own story with photos - a picture book story. 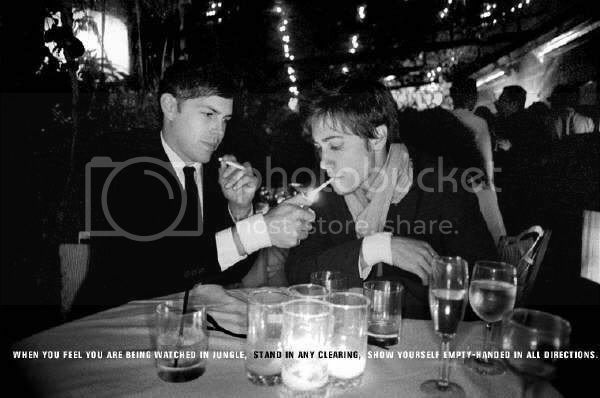 I love that B&W photo though with the guy lighting J's um,, lighting his cigarette. Okay it's Jack with another one of H's mules. ? Or Jack on a date?